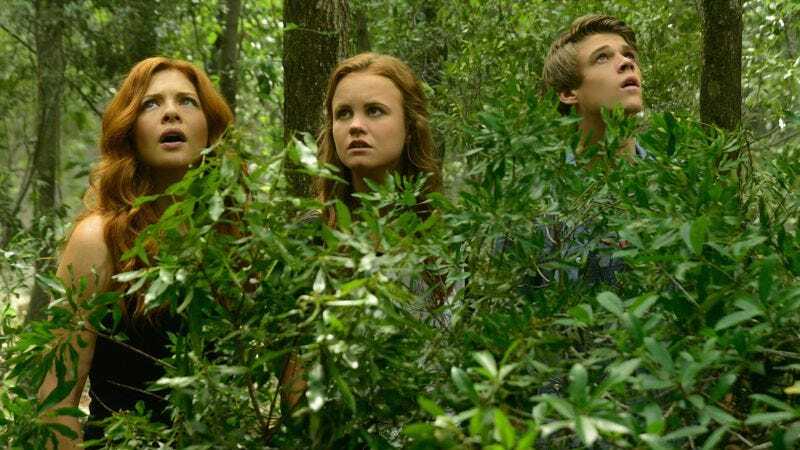 Many readers were understandably concerned last week when regular Under The Dome reviewer Scott Von Doviak appeared to be enjoying watching this program, and even gave it a B+. Jaws were dropped, foreheads were smacked, monocles fell into bowls of soup. But compared to what we’ve been through over the past few years/three weeks with the Dome, it’s understandable that most can view the Dome’s current activities as an upswing. I mean, a few seasons/weeks ago, Junior was going to lynch Barbie, for crying out loud. Now they’re allies. The “resistance,” sorry state that it is, consists of Julia, Norrie, and Joe, led by Big Jim, another strange bedfellow. Also, the caves, pods, purple glow-y things, and random lilac boulders in wheelbarrows in the woods have this great combination of being slightly cool and hilariously cheesy. Christine punching her arm out of her black cocoon last week? Come on, pretty awesome. Fake armageddon backdrop outside the dome? Where else are you going to get visuals like that? Now Christine is out, back and badder than ever, aided by Eva, who looks all silver glimmery in the mirror (another cheesy yet riveting special effect). The kinship has swallowed up mostly everyone, winnowing down our list of moderately interesting characters (which was already a very short list). My favorite so far is Hunter, who—in another momentum-propelling twist—is communicating with a female version of himself (Gia Mantegna) on the outside. This is not to say that certain elements of the Dome still don’t make any sense whatsoever. Christine uses up her power source to do that cool armageddon trick on the outside, then admits to all her followers that it was just a trick, so what was the point of that? Have all the other boats under the dome been destroyed, or why wouldn’t any of the pod people go after the folks who just tried to blow them up? Worst of all, the aliens’ amethysts are keeping the dome from calcifying, which will suffocate everyone. I’m fairly certain during one of these many showdowns Big Jim or Julia must have become aware of this fact. So by still fighting the kinship, they are also sealing the fate of themselves and everyone under the dome with them. Call it Stockholm Syndrome, call it a still-lingering hangover from so many episodes that went absolutely nowhere, but despite these plot speed bumps, the Dome has been giving us episodes lately that make… not sense, exactly, but at least offer some intriguing possibilities and forward movement. (Bombs exploded! Caves demolished!). Also, while some major questions still remain outstanding (like what the freakin’ dome is doing there in the first place), other elements make their own sort of twisted sense: Christina and Eva and the aliens. 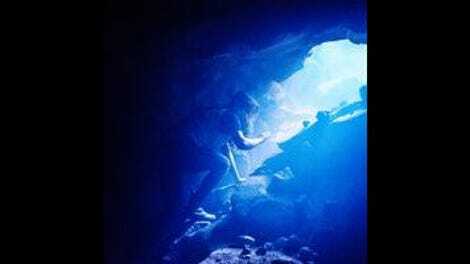 They derive power from the amethysts, which got spread around after Big Jim battered the egg. They turned the Chester’s Mill people into drones so they’ll be easier to control to help mine the amethyst, otherwise the dome hardens and everyone suffocates. Sure, it looks odd when you write it all out like that, but at least it moves from point A to point, well, C 1/2. It beats plotlines like who the monarch is and why the dome turned black all of a sudden. Under The Dome’s major logistical problem (other than lack of compelling leads and some horrible acting efforts) has always been Lost-esque: Where in the hell is this going? Christine and the aliens and whoever she’s talking to on the voice recorder appear to indicate, hopefully, that things will wrap up sooner rather than later. Since the show expanded from its original single-season format, we can only hope there’s some sort of plan in place that will explain things like Bird Island and where the hell Indy the dog came from. In the meantime, the Dome is giving us enough, like the Julia and Big Jim conspiracy, like explosions in the tunnels, like an actual affecting performance by Mackenzie Lintz when she loses the second of two moms to the dome, to keep us mildly entertained until we get there. At least—and I can’t speak for Scott—I think that’s what’s causing the uptick in grade levels. Compared to previous Dome episodes and seasons, the dome is improving. You might even say, expanding. “How is she still alive?” Julia logic: “She must have gotten into a cocoon after she was stabbed,” like anyone with a grain of sense would. I wonder how much Julia would keep going back to save the overall group if not for her boyfriend of a few weeks, True Love Barbie. When, if ever, will Big Jim start saying “Four weeks ago…”? If you look in the mirror and see a shimmery, glowy person, why look in the mirror? “Oh, my shimmery, glowy cheekbones could use some more rouge”? Junior’s face when Christine kissed his uncle, who he had in a headlock, was just inscrutable. Big Jim describing his team: “A cripple, two horny teenagers, and a plucky newspaper girl.” “We’re the best you’ve got!” Plucky newspaper girl, everybody!